In this land, there are wizards and sorcerers. Magic everywhere you look! Some use it for good, some for evil. Darkness is rising over the lands, slowly taking over villages one by one, ruling it with an iron fist. More evil wizards are popping up all over the place, turning the world into darkness. Every village has a crystal, if that crystal is taken, something will happen to that village.The only way to get rid of it, is to use another crystal. However, if all crystals joined together, the person with them would be too powerful to stop. You must make sure that doesn't happen at all cast. Will you be one of the wizards trying to stop this evil, or are you on its side, trying to stop the heroes? The choices are yours! Personality: Thunder is a kind little Pikachu. He likes to help others, even if others don't agree with it, need if that Pokémon is good or evil. Because of this, that gets him into trouble from time to time. He's also curious, getting into things that he shouldn't, and causing trouble or damage to someone or himself. He's also a timid and shy mouse, keeping quiet when in large crowds unless other wise is needed. History: When he was younger, Thunder dreamed of becoming a wizard someday. He got a little hat and wand and tried to work at becoming a wizard from what he saw others do. An old Ninetales by the name of Render came up to him one day, asking him if he wanted to train with him. 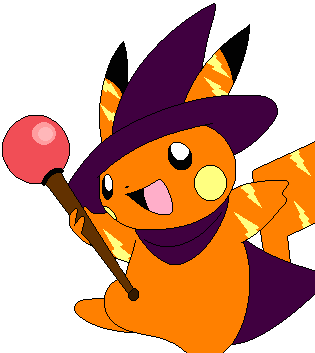 The Pikachu accepted, and has been training as the Fire-type's apprentice since then. One day, a cat Pokémon, a Leopard, appeared, and took the crystal of the village he lived in. His master was taken by the cat, who was working for an evil unknown. Thunder set off to save his master, get the crystal back, and stop evil from taking over the land. Spells: Flotatious-ofarion: It creates a ball of fire that can float in the air. The ball of fire can be thrown at the enemy, by flicking the wand towards them. More than one ball of fire can be created at a time, and thrown at the enemy as well. Electroton-Zapherious: A bolt of electricity will shoot out of the wand at the enemy. If the wielder is an Electric-type Pokemon, they can add their own electricity into it, making it more powerful. Zapticus-Flashious: This spell enhance Electric-type attacks, by 1,000 if the user is high enough of level. If not, then it's a little, going up each time, until it reaches said number. It allows the user to blind enemies temporarily, like someone shining a bright light in their face, allowing the user to get the upper-hand. It also allows the user to control where the lightning goes, like a whip. The user, if powerful enough, can keep it going for however long they wish, unless they're attacked or run out of or low on energy. Volt-Great: Thunder channels all his magic energy onto the markings on his body. He then rushes forward in a frenzy damaging anything close to him. This move damages him however. Other: He has a black and white Mew that is linked to his soul and helps him out with things if he can. Dark will speak using bold. Does anyone want a pokemon wifi battle? who can trade a pokerus infected pokemon?